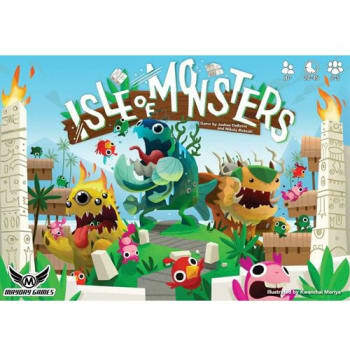 In Isle of Monsters, a set collection, resource-gathering family game, 2-5 players take the role of monster wranglers attempting to gather the scariest team of monsters they can find to compete in the local Scare Faire. Getting screams from the audience gets you acclaim, as does scaring the monsters owned by other players. Each round, players claim monsters and attempt to feed them their favorite foods to get the beasts ready for the Scare Faire. Each monster that's fully fed by the end of a round goes into that player's hand and participates in the Scare Faire. Once every player is finished claiming and feeding monsters, a Scare Faire is held. Each player chooses a single color of monster to play from their hand along with as many cards of that color as they wish. Once every player has chosen, the played cards are revealed simultaneously and the player with the highest scare total from their monsters gets three scream points. Players can also get bonus points for scaring other players' monsters or from having more monsters in hand than any other player. Play continues until there are no more monsters available to replenish the monster decks on the island. The player with the most scream points is declared the victor and Island Protector!